Hi, i was wondering what's the issue with the quality of the brushes while painting on different layers and painting with white. I'm still using Gimp 2.8, but I've also installed a portable version of 2.10, because it's easier to switch between the two in that way. I have tried out the newest original version, and the same issues occur there as well. Especially, when you lower the opacity and you want to build up a volume of a shade, it just looks horrific when it's indexed out. These are all default 25 or 50 hardness brushes, all new options are left untouched. Needless to say, all of these issues are non-existent in 2.8, and I have no complaint to the quality of the brushes there. It's not just with the Paintbrush that this occurs, but also with the others including the Eraser Tool. So is this something that happens with anyone else or is it just me? I'm using Windows 10 and all of my drivers are up to date. If this is suppose to be a normal change, then I have to say that it is a major setback comparing to the 2.8 and I can't understand why was this downgrade necessary for something that worked almost flawlessly. I have another issue when it comes to the white color, and that is when you want to remove it in Color to Alpha option, where the removal is way too strong and out of proportion, but I've managed to 'fix' that by changing layers to Legacy. I might start a thread just for that issue in the future. So, I don't know is it just me or does anyone else have these issues? As I've already said, these are non-existent in 2.8, and that is the reason (among some other) why I still can't completely shift to 2.10. Quality is just reduced while painting and/or shading. There is just no way that this is supposed to be a 'normal' behavior. Or I'm missing something out of the new options. The eyes gave in about a quarter of the way through that, a bit like an impromptu Rorschach test. 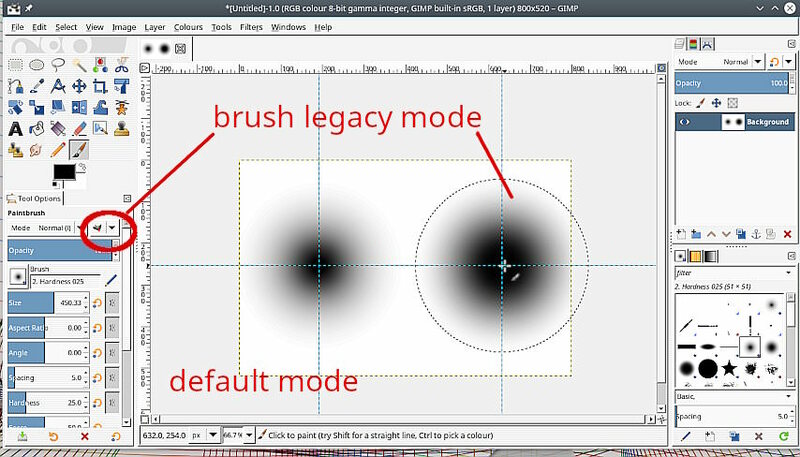 There is a difference between Gimp 2.8 and Gimp 2.10 That is why there are legacy modes available. This the same brush (3 clicks, same place) default mode and legacy mode. (10-13-2018, 01:55 PM)rich2005 Wrote: The eyes gave in about a quarter of the way through that, a bit like an impromptu Rorschach test. Legacy mode is here to stay in future versions as well, right? I just can't wrap my head around this new... arrangement. Was totally unaware of it, to be honest. Well it is a new edition of Gimp, so some radical changes. Default Legacy modes are there for backward compatibility. If you are using Gimp for art then one useful difference is the fix for RGB semi-transparency blending. I think there are lot of digital painters that are looking into software such as Gimp and similar as alternatives to popular ones. From the post you gave me it seemed somewhat of a similar issue with someone who was interested in painting and not knowing of Default and Legacy. I don't know... I like to do a lot of black and white rendering and so far the Legacy (or 2.8) has served me quite well in that regard. You said that 'Default modes are there for backwards compatibility' and not the Legacy one, is that correct? My mistake, I did mean Legacy modes for backward compatibility. (10-13-2018, 04:36 PM)rich2005 Wrote: My mistake, I did mean Legacy modes for backward compatibility. Yeah... I still don't quite understand the whole linear vs perceptual RGB thing. I should look into it more. How is this issue resolved in Photoshop, does anyone know? I don't use it, so I don't know how the brushes function there. Is it more seamless? As I've mentioned, the example with the lower opacity in the Default mode is... I'm just not satisfied with that look, even though it should be more correct, I guess. "Photoshop actually has the ability to do layer blending in linear space. To turn this “feature” on we need to hit the checkbox labeled “Blend RGB Colors Using Gamma 1.00” in the Edit->Color Settings dialog. In my version, I have to hit “More Options” to see the toggle. Why isn’t this the default setting for layer blending?" As best I can tell, the 2.10 default mode removes the Gamma adjustment before applying the brush strokes, and then it reapplies the gamma correction to render the brush strokes. Confusing, I think, but the math seems to work correctly. The default layer modes work well. for example the 'addition' layer mode in default adds the mathematically correct values, but the legacy 'addition' blows out the bright areas way too quickly. I find the subject confusing. A displaced gradient with sRBG creates a curved ramp in Blender. Seems like it's all work in progress... I personally don't mind both options. My thinking is that they should both remain and that the option for switching from one to another should be just more accessible if someone wants a specific result. I really don't think either should be excluded. Thanks for the heads up on how it works in Photoshop. It's interesting that it's not a default mode there. Current time: 04-22-2019, 08:12 AM Powered By MyBB, © 2002-2019 MyBB Group.